Translated from Italian as “little arms or little shoots,” broccoli is eaten by many different cultures in many different ways. This hearty vegetable is in the brassica family, and is most closely related to cauliflower, (both are essentially the bud of a flower that will otherwise bloom and seed if left to grow). Unlike cauliflower, which prefers mainly cool climates, broccoli can thrives in many different regions of the world. 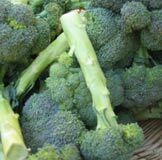 That said, broccoli best in the winter when the cold weather helps it retain its sugars. When buying broccoli, the stalk, leaves, and florets should be fresh, firm, and brightly colored, with tightly closed buds. Avoid broccoli with a woody stalk or yellow florets. Store broccoli in the fridge, preferably in the crisper. Blanching this vegetable will preserve the color (unless it’s the purple variety, in which case it will turn green when cooked, regardless of the method). When boiling, use a larger of quantity of water; it will minimize the odor. Avoid covering broccoli in a pot with a lid as it causes its color to fade. Steaming this vegetable is the best way to preserve its color, flavor and nutrients.